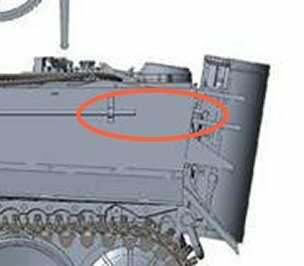 The Rye Field Model "Bergepanzer Tiger 1" has a feature that exists on no other Tiger; a long thin pipe is attached to the left hull side. It is held in the clips that normally hold a cable. 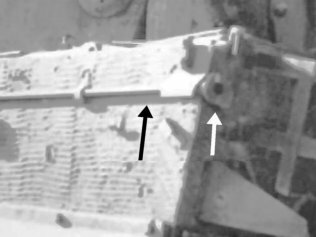 The rear of the pipe does not reach to the rear of the model tank, as you can see in this CAD image released by Rye Field. The purpose of this pipe is as yet unknown. But it is clear from this photograph that the real pipe extends to the back of the real Tiger. At its end we can see a circular item; it's not clear whether this is part of the pipe or a socket for the pipe. There also seems to be a small protective cover attached to the hull. In the photographs, the front of this pipe is bent upwards. We don't know whether this is damage, or whether the pipe runs across the roof of the Tiger's hull. Without knowing the purpose of this pipe, we cannot deduce its correct shape. Rye Field provide a straight pipe in their kit.